When you stay at Extended Stay America - Baltimore - BWI Airport – Aero Dr. in Linthicum Heights, you'll be near the airport, within a 10-minute drive of Baltimore Cruise Terminal and M&T Bank Stadium. This hotel is 6.2 mi (9.9 km) from Horseshoe Casino Baltimore and 6.5 mi (10.5 km) from Arundel Mills Mall. 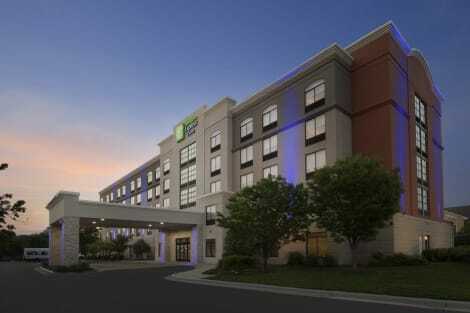 Newest BWI Airport Hotel with 24 Hour Shuttle The Holiday Inn Express Hotel & Suites Baltimore – BWI Airport North is just 3 miles to Baltimore Washington International (BWI) Airport so you can make getting to and from your flight easy. 3 miles to the Baltimore lightrail means you can get to downtown Baltimore or Inner Harbor in 20 minutes to watch a game. Take advantage of easy access to I-95, 295 and I-695. Leisure guests will love our proximity to Arundels Mills, with both shopping and a casino. Government travelers appreciate our 7 mile proximity to both Fort Meade and NSA. Enjoy walking distance to a variety of restaurants. Our free shuttle operates to and from the airport 24 hours a day, leaving the hotel every 30 minutes. Our oversized accommodations, both standard rooms and suites, also offer free Wi-Fi, parking (during your stay only) and hot breakfast. Maintain your workout routine in our 24-hour fitness center or swim laps in our indoor pool. Each room is equipped with a microwave, mini-refrigerator, iron, and in-room safe. Business travelers staying in our Linthicum Heights accommodations will not be disappointed given our ample amenities. Our meeting space is ample, at 1205 square feet and the business center is available 24 hours. Book Now! When you stay at Country Inn & Suites by Radisson, BWI Airport (Baltimore), MD in Linthicum Heights, you'll be in the business district, within a 15-minute drive of Baltimore Cruise Terminal and M&T Bank Stadium. This hotel is 6.7 mi (10.8 km) from Horseshoe Casino Baltimore and 7 mi (11.3 km) from Arundel Mills Mall. Located in Linthicum Heights, Hilton Garden Inn BWI Airport is in the business district, within a 10-minute drive of M&T Bank Stadium and Oriole Park at Camden Yards. This hotel is 6 mi (9.7 km) from Horseshoe Casino Baltimore and 6.3 mi (10.2 km) from Arundel Mills Mall. When you stay at Embassy Suites by Hilton Baltimore at BWI Airport in Linthicum Heights, you'll be in the business district, within a 15-minute drive of Baltimore Cruise Terminal and M&T Bank Stadium. This hotel is 6.9 mi (11.2 km) from Horseshoe Casino Baltimore and 7.3 mi (11.7 km) from Arundel Mills Mall. Take advantage of recreational opportunities offered, including an indoor pool, a spa tub, and a fitness center. Additional amenities at this hotel include complimentary wireless Internet access, a fireplace in the lobby, and a picnic area. Guests can get around on the complimentary shuttle, which operates within 3 mi. Make yourself at home in one of the 315 guestrooms featuring refrigerators and flat-screen televisions. Your pillowtop bed comes with down comforters and premium bedding. Wireless Internet access (surcharge) keeps you connected, and cable programming is available for your entertainment. Private bathrooms with shower/tub combinations feature complimentary toiletries and hair dryers. lastminute.com has a fantastic range of hotels in Linthicum Heights, with everything from cheap hotels to luxurious five star accommodation available. We like to live up to our last minute name so remember you can book any one of our excellent Linthicum Heights hotels up until midnight and stay the same night.